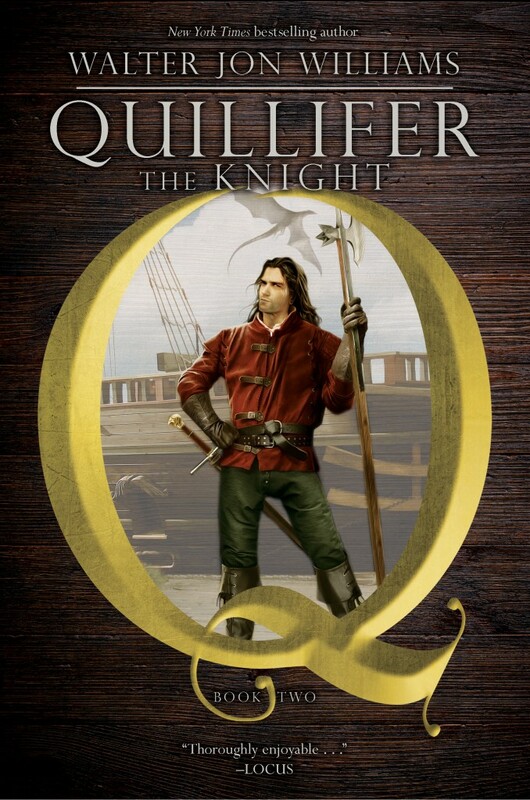 Here’s the cover for Quillifer the Knight, which I am reliably informed will be released in October 2019. Unfortunately Greg Manchess wasn’t available for the new cover, but the excellent Alejandro Colucci stepped in and did a splendid job. Maybe it’s just the first-impression-sets-the-standard thing, but he doesn’t look like Quillifer. This Quillifer has a different smirk. And if I didn’t know better, I’d suspect that Ty Frank was the model. I mentioned dragons in the first book, though none appeared onstage. There were a couple of wyverns, though. Love the overall look, but the longsword guy in me can’t help but ask: is Quillifer left-handed? Or does the artist not realize you can’t draw the weapon right-handed if it’s worn on the right? Well, you can argue over the side the sword is on, but Colucci is definitely a stickler for accuracy in dress — he actually as Qullifer in pants with a button-up fly. It doesn’t really matter what side the sword is hung on, because Quillifer doesn’t know how to use it anyway. Will there be a Hardcover if this? All my wishlist entries for the hardcover magically changed themselves to paperbacks. Last I looked, hardcover was one of the options available for purchase. It seemed as if they were releasing hardback and pb simultaneously. Previous post: Now Hear This!